Despite their small size, dwarf gardenias (Gardenia jasminoides "Radicans") pack a punch in the landscape. Although the ornamental perennial plants only grow 2 to 3 feet high and spreads 4 to 5 feet, they produce glossy leaves and 1-inch-wide, fragrant, white flowers in early to midsummer. Suitable for small gardens and containers, the dwarf gardenia draws attention and livens up the indoor or outdoor space, especially during bloom. Care for the plant so it remains healthy and produces attractive foliage and flowers. 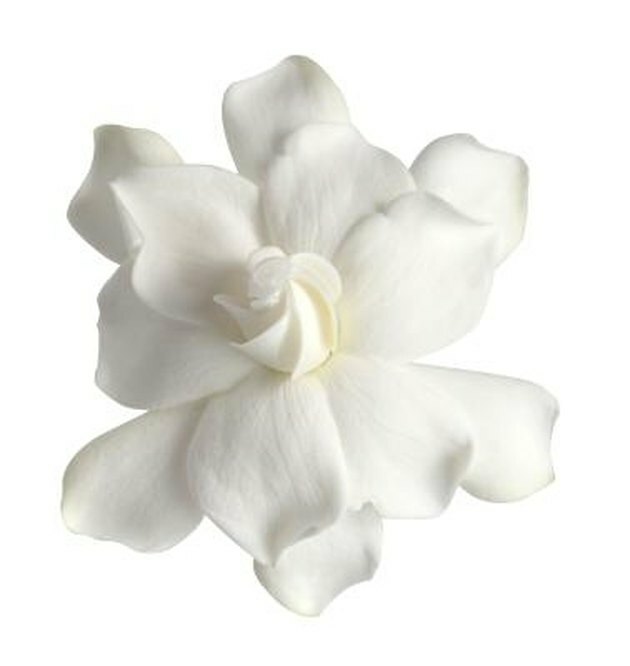 The dwarf gardenia produces fragrant blooms. Grow the dwarf gardenia in well-draining, fertile, slightly acidic soil exposed to full sunlight or partial shade. If growing the dwarf gardenia in a container, use one with adequate drainage holes through its base and fill it with quality potting soil and organic matter. Provide the plant good air circulation to reduce chances of fungal disease. Water the dwarf gardenia frequently during the first year to help it establish a deep root system using a soaker hose. Afterward, water the plant two to three times a week until the soil is evenly moist. Spread 1 to 2 inches of organic mulch around the base of the plant to deter weeds and keep the roots cool. Space the mulch 4 inches from the main stem or trunk of the plant to prevent rot. Feed the dwarf gardenia an acid-loving fertilizer at half the recommended strength from the end of March to end of summer. Follow label directions for application rates to prevent overfeeding the plant. Stop fertilizing the dwarf gardenia during fall and winter. Trim the dwarf gardenia in the summer, immediately after it finishes flowering. Using sharp, sterilized pruning scissors, remove dead or damaged wood from the plant, along with crossing branches and faded blooms. Inspect the dwarf gardenia for insects such as aphids, scale and white flies. Spray infested parts of the plant with a jet of water from a hose, or mix 2 to 3 tbsp. dishwashing detergent in 1 gallon of water and spray the pests to deter them.